Women are hooked on this breakthrough Miracle Immediate Wrinkle Filler ... literally watching wrinkles disappear! Inspired by cutting edge dermatological techniques, Minus 417 Dead Sea Cosmetics unveils a breakthrough collagen formula for instant, wrinkle filling action and continued improvement after extended use. The powerful combination of essential oils, unique vitamin mineral complex, jojoba, borage, wheat germ, avocado, marine collagen, dead sea minerals and mud provides an instant lift, stimulating firming action while rejuvenating the skin. Immediately skin is tightened, lifted, smooth, soft, nourished and glowing. 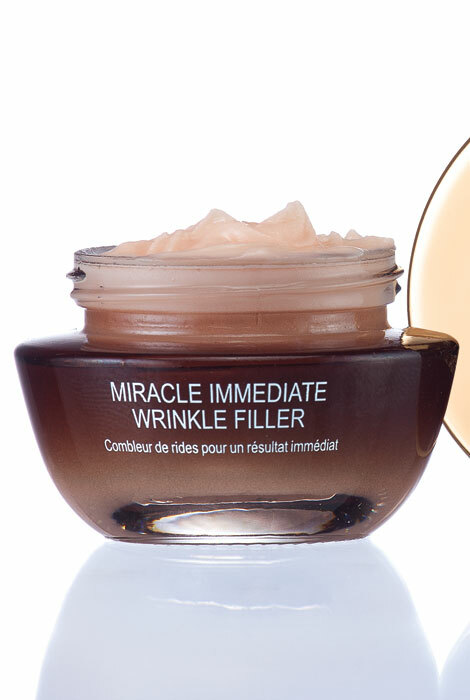 Apply wrinkle filler as a cream on fine lines or use filler directly on deep lines. Use morning or evening, before or after makeup. Paraben free and mineral oil free. 1 oz. 5 star rating. liked immediate results. Trying to diminish some of these "life" lines! This product works wonderfully to fill in lip lines. would definitely recommend. To get rid of wrinkles on my chin. For my wrinkles especially around my mouth. is this good for lines around the mouth? BEST ANSWER: Thank you for your question All three are good for facial wrinkles including wrinkles around the mouth.